Earl of BedFord's, &c. Estates. Privilege of a Member in a Suit. SIR Philip Musgrave and Mr. Finch have leave to go into the Country. 2da vice lecta est Billa, An Act for Settling of divers Lands and Tenements upon Wm. now Earl of Bedford, Katherine Countess Dowager of Bedford, John Russell and Edward Russell, Sons of Francis Earl of Bedford, deceased: Upon Question, committed unto Sir Arthur Ingram, * Mountfort, Mr. Strode, Mr. Wheeler, Mr. Trenchard, Sir Gilbert Gerrard, Mr. Carew, Sir Sam. Rolle, * Hunt, Mr. Upton, Mr. Selden, Lord Fairefax, Serjeant Glanvile, * St. Johns, Sir Edw. Deeringe, Mr. Moore, Mr. Nicholls, Mr. White, * Roger North, Lord Falkland, Sir Rich. Buller, Lord Ruthyn, Mr. Hide, Mr. Cage, Mr. Purfrey, Mr. Schowen, Sir Antho. Irby, Sir Arthur Haslerigge, the Knights and Burgesses of Devon: And are to meet this Afternoon, at Two of Clock, in the Star-chamber. Whereas there is a Suit depending between Mr. Pymm, a Member of this House, and another, concerning Tythewood: It is Ordered, That the said Mr. Pymm shall have Privilege of Parliament; and that Lewis Lushford, and others, the Attorneys and Solicitors on the other Side, shall be hereby enjoined to forbear to prosecute, or further to proceed in, this or any other Suit, that concerns the said Mr. Pymm . Mr. Wasthall reports the Bill concerning Billet-money, with the Amendments and Additions: The which Amendments and Additions were twice read by Mr. Speaker: And then, upon the Question, the Bill, with the Additions and Amendments, ordered to be ingrossed. Mr. Wasthall, Mr. Cage, Mr. Bellasis, Sir Jo. Hotham and Mr. Carew are to retire into the Committee-chamber, to consider of some small Amendments to the Bill. Edward Dowse has Leave to go into the Country. "I give many Thanks to both Houses of Parliament, for their great Care of my Health, and their Affection to me; hoping I shall see the Effect of it. Truly, nothing but my Health could have made me to resolve of this Journey: And, if I thought I could serve the King and this Kingdom with the Hazard of my Life, I would do it: And I hope you believe I have so much Interest in the Good of this Kingdom, that I shall never wish any thing to the Prejudice of it:"
"You will pardon the Imperfectness of my English: I had rather spoken in any other Language; but I thought this would be most acceptable." 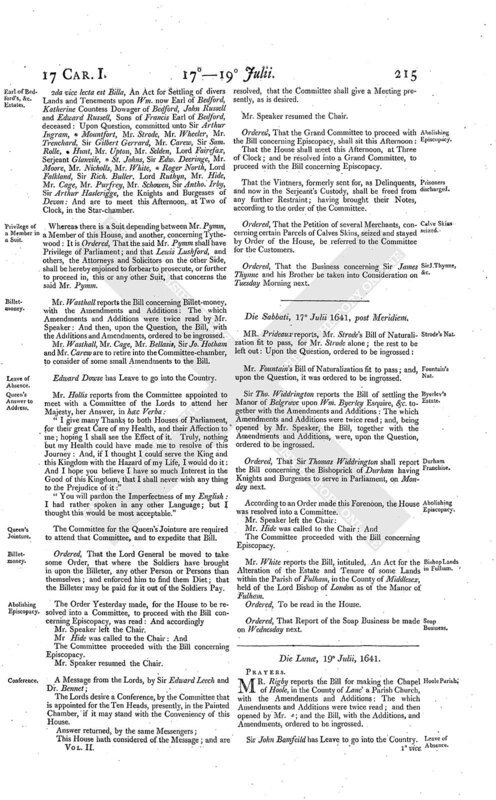 The Committee for the Queen's Jointure are required to attend that Committee, and to expedite that Bill. Ordered, That the Lord General be moved to take some Order, that where the Soldiers have brought in upon the Billeter, any other Person or Persons than themselves; and enforced him to find them Diet; that the Billeter may be paid for it out of the Soldiers Pay. The Committee proceeded with the Bill concerning Episcopacy. The Lords desire a Conference, by the Committee that is appointed for the Ten Heads, presently, in the Painted Chamber, if it may stand with the Conveniency of this House. This House hath considered of the Message; and are resolved, that the Committee shall give a Meeting presently, as is desired. That the House shall meet this Afternoon, at Three of Clock; and be resolved into a Grand Committee, to proceed with the Bill concerning Episcopacy. That the Vintners, formerly sent for, as Delinquents, and now in the Serjeant's Custody, shall be freed from any further Restraint; having brought their Notes, according to the order of the Committee. Ordered, That the Petition of several Merchants, conscerning certain Parcels of Calves Skins, seized and stayed by Order of the House, be referred to the Committee for the Customers. Ordered, That the Business concerning Sir James Thynne and his Brother be taken into Consideration on Tuesday Morning next. 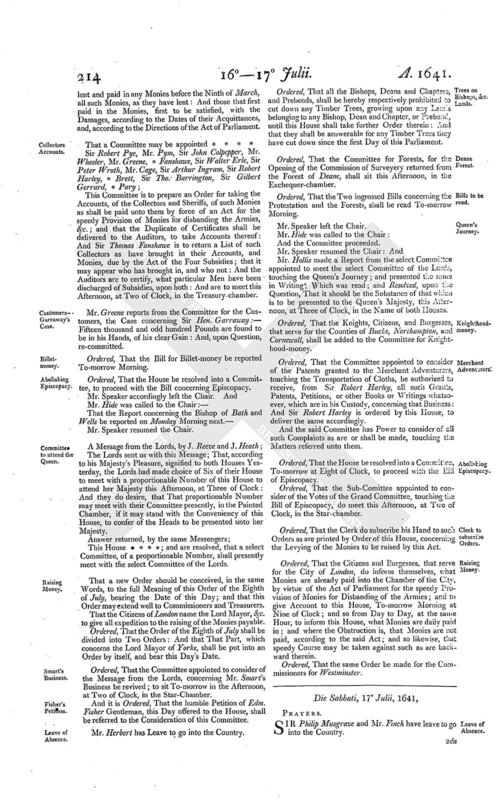 Mr. White reports the Bill, intituled, An Act for the Alteration of the Estate and Tenure of some Lands within the Parish of Fulham, in the County of Middlesex, held of the Lord Bishop of London as of the Manor of Fulham. Ordered, To be read in the House. Ordered, That Report of the Soap Business be made on Wednesday next.